Puppies love to bite for a variety of reasons. Sometimes, they are just exploring the new world around them and want to taste things just to see what they are. Other times, puppies may be biting because they are teething and are looking to relieve the pain. While it may seem cute and harmless now, puppies that are not taught that biting is unacceptable grow up to be dogs that bite - which can be both frustrating and dangerous. If you have a puppy, you want to nip biting in the bud as soon as possible before it becomes a problem. If you suspect that your puppy bites because it is teething, purchasing a dog-specific teething toy should remedy the problem. However, if that isn't the issue, there are steps you need to take to break this bad habit. Puppies love to bite soft things, including furniture upholstery, pillows, and even your clothes. You may notice that your puppy follows along behind you, nipping at your pants. This may seem funny, but it can be a hassle when your pet chews through the fabric. Not only are your pants ruined, but your pet could potentially choke on the fabric. How do you handle such a situation? The first thing you should do is set up a time-out area. Yes, you will be treating your puppy just like a naughty child. This could be a small section of a room blocked off by a baby gate or a tether that is set up in a safe place. Next, make sure that you have provided your puppy with soft objects that it can chew on rather than your pants. This could include a stuffed animal or stuffed toys that are designed for dogs. You can also teach your puppy other ways in which it can behave. By making it learn to sit while greeting or touching its nose to your hand, you can help it to learn new behaviors that will distract it from chewing your pants. 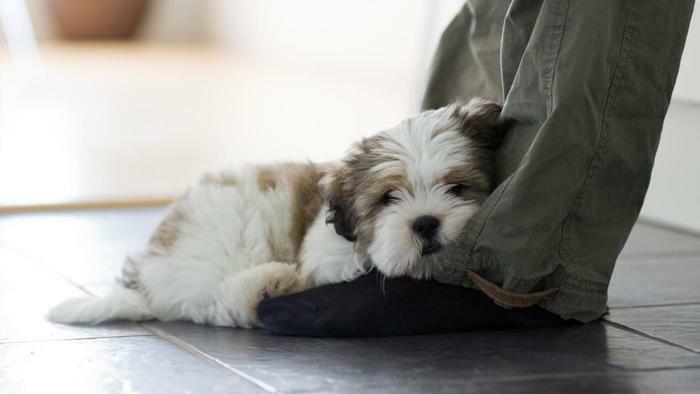 If your puppy tries to bite your pants, give it a gentle but firm warning and offer the pet one of its soft toys. The puppy at this point will have to make a decision: Stop the bad behavior and chew on something approved, or continue the behavior and get put into a time out. To ensure the time out works, make sure that you do not scare the dog, and that you (or the person who primarily trains the dog) is the person giving the cues. You will have to go through this process several times: bite, warn, timeout. It will take some time for your puppy to learn and understand that this behavior is unacceptable. When your puppy does make the right decision, it is important to reward it with plenty of praise and even a treat. It's also important to note that destructive behaviors can ocur when a puppy has too much energy or is bored. Make sure that you are spending time with your dog playing and providing daily exercise. This can give your puppy the release of energy it needs to curb bad behaviors, while providing health benefits and bonding time for the two of you.